A girl can never have too many midi skirts in her closet, especially when they’re as fun and feminine as the ones we have here at Morning Lavender! We have the perfect midi skirt for every occasion and style, and love the fit and flare silhouette from pairing our midi skirts with crop tops! If you’re looking to refresh your Spring wardrobe, check out these nine pieces below! Don’t forget to check out our selection of crop tops to pair with all of the midi skirts in your closet! Casual Fridays are our favorite excuse to wear the comfiest pieces in our closet. That being said, here at Morning Lavender there’s no such thing as sporting sweats and a t-shirt out because staying chic is a priority whether you’re dressing up or down. The tip to casual and chic Spring outfits is choosing accessories that aren’t too flashy or colorful, and sticking with a neutral handbag like our Ines Reversible Tote Bags (They come in Ivory/Brown and Black/Brown, and trust us you need both)! Check out our casual and chic outfits below for a little inspiration for the next time you’re grabbing lunch with a friend or going out for a day of shopping and errands! Don’t forget to show us your favorite casual and chic outfits by tagging #shopmorninglavender on Instagram! We’d love to see what you come up with and feature you on our page! We’re all about making the most of your wardrobe, and filling your closets with versatile staple pieces! 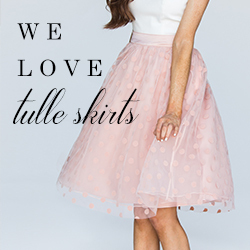 If you’re looking for a dress that can be casual, cute, dressy, and even work appropriate it’s our Annette Tulle Dress. This dress is every Morning Lavender girl’s dream come true, from the pretty taupe color to the soft tulle skirt. Check out how we styled this dress 11 chic and unique ways! If you loved these styling tips, don’t forget to check out our Spring Capsule Collection to see how we styled 10 pieces 25 ways! Spring is the perfect time to be bold! Warmer weather gives you the perfect opportunity to flaunt your favorite print dresses and styles. The key to wearing bold floral prints effortlessly is to pair them with neutrals: from your accessories to your entire outfit if you’re flaunting a bold floral scarf! Check out our Spring outfit ideas below to see how you can style our top selling bold floral pieces from our new Spring collections! We hope these outfit ideas inspired you to make the most out of your favorite bold floral pieces! Don’t forget to tag us in your photos using #shopmorninglavender on Instagram so we can see what bold looks you can come up with! Our Spring Capsule Collection is finally here! 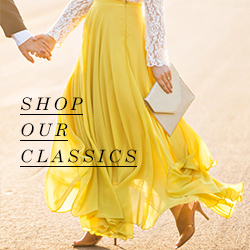 This has been of of our best and most fun collections to put together, and we’re so excited to show you different ways to wear our favorite pretty Spring pieces for this season – 10 pieces worn 25 ways! When a dress or romper can double as a top, or a button up can transform multiple outfits, it allows you to get more bang for your buck (and who doesn’t want that?)! And did we mention that every piece in our Spring Capsule Collection is under $74.99?! If you love what you see below, don’t forget to check out our first Capsule Collection and our Fall Capsule Collection for more outfit ideas! We hope these outfit ideas won’t only inspire you to refresh your Spring wardrobes, but also to make the most of the existing pieces in your closet!